Let’s talk about everyone’s favorite dish… Pizza. 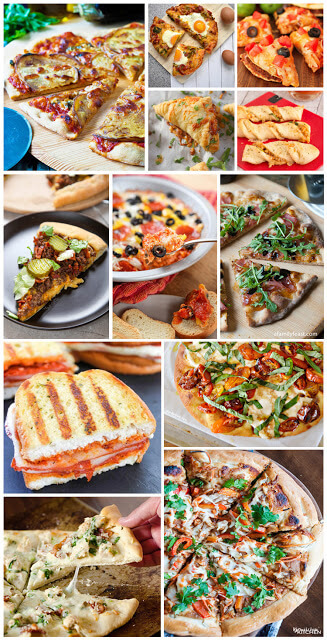 There’s no real way to do pizza “wrong”, but oh SO many ways to do it right! 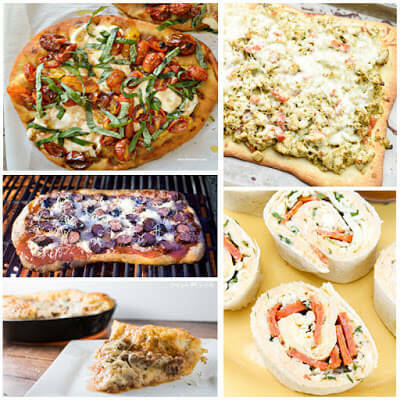 😉 With all of the different variables that go into pizza, we thought it’d be fun to share 25 Creative Pizza Recipes to get your mouth watering, brain moving and more importantly, oven getting hot! Try these out for dinner or the next time you’re hosting – none of these delicious recipes will disappoint! Our family favorite pizza is this yummy, easy-to-make Taco Pizza Recipe. You’ll also love these BBQ Chicken Pizza Twists are a fun take on your average pizza pie! When you have guests over for a night of fun, make a couple of Chicken Alfredo Pizza pies – they’re sure to impress. A delicious Thai Chicken Pizza recipe that takes under 30 minutes? Yes, you read that right! A fun party food that brings yet another delicious twist to our beloved pizza – BBQ Chicken Pizza Turnovers. Say what?! You have to try these out. This Grilled Three Cheese Sausage Pizza is oh-so-yummy and SO different, too.. Who would have thought that this combo would be so delicious? When the kids want to help out and cook with you, try out this Sweet Chilli Chicken Pizza made on the grill! Fun for all and oh-so-yummy, too. What better for a busy night than an easy to make BBQ Chicken Pizza? It has a delicious honey crust that you have to check out! Have yourself a meatless Monday meal with this delicious and cheesy Cheesy Spinach Artichoke Pizza – yum! A fun twist on your typical pizza pie… Pepperoni Pizza Grilled Cheese! Say what?! You read that right – this delicious grilled cheese is perfect for the whole family! 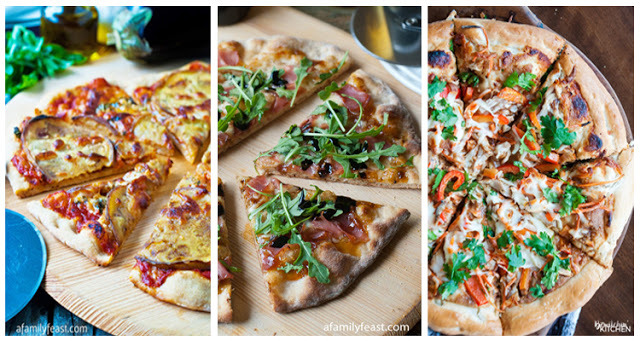 Is pizza night a tradition in your house? It is in ours, and we can’t wait to make this Chicken Pesto Pizza on our next pizza night! A Caprese Flatbread Pizza is exactly what you need after a LONG day! This pizza recipe is topped with the most deliciously cooked tomatoes… Check out how they add in that extra flavor! Having friends and family over for a party? They’ll LOVE this Pepperoni Pizza Dip! It looks incredible and is pretty simple to make, too! When the kids need an after-school snack or you have a busy day and need something simple to make for dinner, try out these Tortilla Pizza Pinwheels. What a fun twist on everyone’s favorite pizza! Ever dream about having pizza for breakfast? Well it’s your lucky day! Make a delicious Sausage & Egg Breakfast Pizza or Garlic and Basil Egg Breakfast Pizza to enjoy on a Saturday morning. Yum! Want to spice things up and get a little fancy? 😉 This Eggplant Garlic Pizza is a fun twist on your typical pie and is so fun to make! No one ever said that pizza had to be average… Cue the most delicious Bacon Cheeseburger Pizza EVER! Just check out all of those toppings… It’s the best of both worlds! For moms-night-in or a family gathering, add a Prosciutto and Fig Pizza with Arugula to the menu for a delicious twist on the menu. The secret to making this so delicious is the balsamic blend… We all need this recipe in our lives! Have a busy day and don’t know what to make for dinner that’s quick, simple and won’t leave you pulling your hair out? Problem, solved! A Crockpot Pizza Casserole is the way to GO! This Deep Dish Skillet Meatball Pizza is a perfect Sunday night dinner for the family – all you need is a skillet! Who doesn’t love a good copycat recipe? This Copycat Taco Bell Mexican Pizza is the perfect recipe that everyone needs in their lives! Everyone loves pizza, and everyone could use some during a busy week! There’s nothing better than a One-Pan Pizza Pasta Skillet on a busy night. The whole family will be going for seconds (and maybe even thirds). What’s better than pizza for dinner? Oh yeah, pizza for DESSERT! This delicious S’mores Pizza will be a crowd favorite and is sure to go quickly. Looking for some new ways to enjoy everyone’s favorite dish? These Pizza Waffles are the perfect dish for everyone – adults and kids alike! If you ask us, you haven’t truly experienced pizza until you’ve made Pizza Quesadillas! These are to-die-for. Just wait until you try them out!